I was attempting to take a picture of a dew-sparkled spider web in the sunlight. Please note, I, being more of a kill it with fire type person when it comes to spiders, am hardly an arachnid’s BFF. 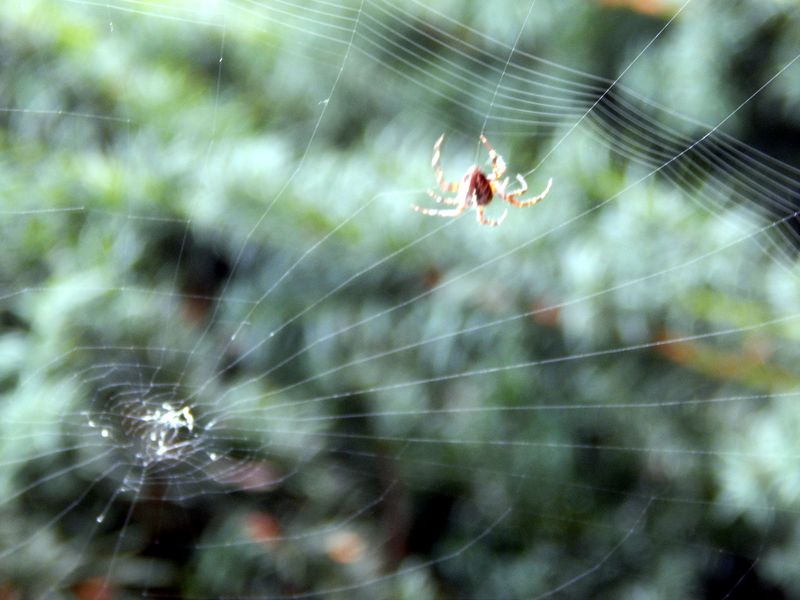 Still I admire the delicate, intricate complexity of a well spun spider web – go figure. I took several pictures from different angles around it, but they were all from above. The problem, soon I realized, is that the picture I knew it could be, the picture I wanted would never be captured standing from above. I tried crouching and bending down, but it wasn’t giving me what I wanted – the clean lines of the web itself. It was becoming clear, I was going to have to get below it. Below it, as in get on the ground. The ground was still damp from the morning shower. I was so not doing that. Not to mention, I am in a public park. Though no one was around at the moment, I had no way of knowing how long I was going to be down there trying to get the right shot. Friends were one thing, but did I really want strangers seeing me potentially sprawled out in damp grass out trying to take pictures of – what? Unless they came close they would not see the web. It was pure luck the sunlight played off the diamond dew drops capturing my attention that kept me from walking right through it. From a distance, it would look more like I was taking pictures of the space between the bushes. That would surely raise an eyebrow. As it was, it seemed even the spider was looking at me kind of dubiously as I changed angles from a still standing position. It became one of those odd times where the artist screamed against the practical. As I heard voices approaching it was also one of those odd times where the artist lost. Personal vanity won this round as I walked away. I mean, what’s a I take pictures even if the only person who likes them is me going to do? I’m no Ansel Addams (no relation to Gomez by the way), it’s not as though with my little camera I was going to have an image of such high quality as to be posted on gallery walls, or at a museum or even the zoo. The only person who would know or even care that I didn’t get the picture is me. And I could live with that. As I continued walking around the park taking pictures, enjoying the company of my friend I was visiting, spidey and that darn web kept popping into my mind. I really wanted that picture. We had to pass through the same area to exit the park, thus I made up my mind that I was taking the picture. The sun had shifted and I again almost walked right through not seeing it as I had forgotten the one very important thing – dew drops dry in sunlight. I had let vanity win and the opportunity to photograph the dew sparkled web had passed. The artist in me enjoyed a moment of schadenfreude (nyah-nyah, nyah-nyah, nyaaaah nyah! ), even as I lamented the loss (boo-hoo). So what do I do now? Lemonade time. With the shifting sun I could now get, what I could not get a couple of hours previously, good clean lines. Knowing I was likely going to rise with slightly muddy knees, passers-by maybe watching – maybe not – I didn’t care, and practical be damned! I didn’t think twice about it this time as I immediately dropped to take the shot. I was looking through my digital photos in search of one in particular to show someone and came across spidey here. While it is the best of the dozen or so shots I took, it is not the greatest – as I knew it would be, but I like it and as one of my favorite bands would say, Nothing Else Matters. It is a great picture. It always amazes, when I see a spider’s web, how intricate they are. In the house, however, whenever I see a spider I usually pull a Garfield although I don’t use a newspaper. Oh, I’m in total agreement on indoor versus outdoor spiders, Arjeha. Grabbing the camera would have been the *last* thought on my mind had I seen that inside any four walls near me. Thanks. Ha! Interesting how the universe works. Love the photo. I take photos too and I could so relate to this post! Thanks Travelinma, glad you could relate. Screaming artists rock. Neat web you caught there.